Kiva is best known for funding loans to help entrepreneurs around the world grow their businesses. 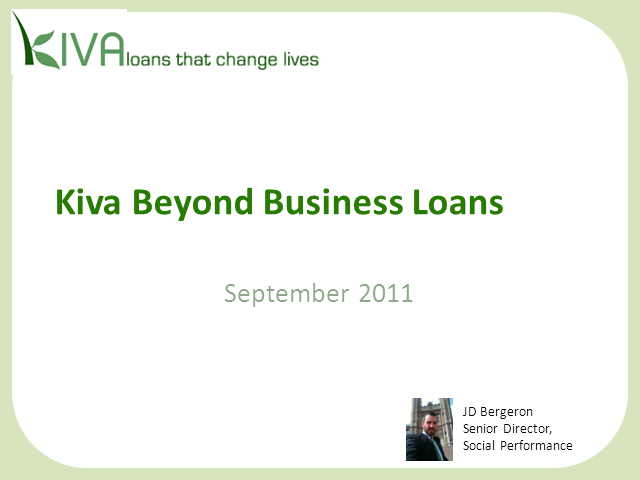 Learn what Kiva is doing to fund non-financial services and non-traditional loans. Join Kiva's Director of Social Performance JD Bergeron for a conversation about what Kiva is doing to extend opportunity to more borrowers -- and give our lenders even more choices! This webinar will look at the innovative services our partners offer to clients, including savings accounts and loans tailored to families, farmers, small enterprises and more. Kiva awards these partners with Social Performance badges, making it easier for lenders to find loans that encourage these life-changing services for borrowers. Tune in on May 30 at 2 p.m. PST to learn more and ask all your Kiva questions! This webinar will focus on women, where they fit into our social performance system, what some of our partners are doing to empower them, examples of loan products targeted at women, and how lending to women has a major ripple effect on families, gender equality, communities, etc. Kiva's Senior Director of Social Performance, JD Bergeron, will go into more detail about three Social Performance badges at Kiva: : Anti-Poverty, Vulnerable Group Focus, and Client Voice. We'll be going through the various channels Kiva uses to reach borrowers in need of capital around the world. We're introducing a new feature to our website - social performance badges for our Field Partners. Listen in to learn about what these badges are all about and how to use them as you lend on Kiva. Find out what issues Kiva has to work through before partnering with organizations in certain countries around the world. JD Bergeron, Kiva's Senior Director of Social Performance, talks about what Kiva looks for in Field Partners. Kiva is the world's first person-to-person lending website. Through Kiva, you can make a loan to individuals, helping them to improve their businesses and their lives.